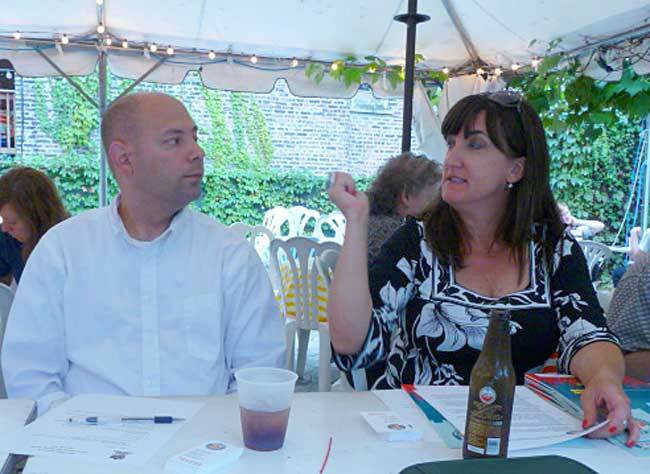 Matthew Westfallen of SSA 29 and Kara Salgado of the West Town Chamber of Commerce. Their array of festivals has spread from Division and Chicago to Grand Avenue with Design Harvest, a decorating expo from Damen to Wood on Oct. 2 and 3. Meeting commenced at 7:05 p.m. Jessica Oloroso, who owns Black Dog Gelato, did a brief presentation for the monthly business minute. The restaurant opened two weeks prior and is located at 859 N. Damen. Hours of operation are weekdays 12-10 and Friday and Saturday 12-11. Guest speakers Kara Hughes Salgado, director of the West Town Chamber of Commerce, and Matthew Westfallen, the program manager for SSA29, presented to the group. The West Town Chamber of Commerce is currently located at 1810 W. Chicago. Information packages and contact information were handed out to the group. Arborist Mark Duntemann gave an update regarding planting trees on Augusta Boulevard. After spending some time on Augusta and in the East Village area, he stated that most Augusta sidewalks are 8 feet and the city only plants on sidewalks that are at least 9 feet. However, he mentioned some ideas. He also stated that he is interested in evaluating the whole East Village neighborhood and mapping out what trees exist, what space is available and what are some possibilities for not only Augusta but for other areas in the neighborhood. He agreed to have a plan drawn up by August for the whole neighborhood. Neal McKnight updated the group about the proposed Galleria liquor store on the southeast corner of Ashland and Division. Ald. Joe Moreno told McKnight that he could not comply with the requests EVA made about lifting a moratorium and doing an overlay moratorium to prevent other liquor sales establishments from entering the area. The alderman was willing to downsize to B-1 zoning but that leaves a 12-month window where other liquor sales establishments could come in. McKnight also stated that the owner is now questioning his decision to pursue the location because CVS plans to open across the street and it will be major competition. The City Council passed Division Street pedestrian designation, McKnight said, from Leavitt to Milwaukee.